Returning to Mont Ste Anne was a race I was really looking forward to not only because it is one of my favourite tracks of all time, but it now has a special place in my life as the track where I won the world champs title last September. Returning there was a great feeling and being in the lead of the World Cup series was an added bonus as this was one of my races in the year where I had set my goal to win. I knew the track suited me, my riding style and my fitness so I was keen to get back to the top step of the podium. Weather conditions were certainly not in our favour, yet another wet world cup was on the menu. The ground was so saturated after weeks of rain that water was just seeping out of the ground everywhere. We also had some dense low fog during practice that made it impossible to even see the next corner ahead of you ! 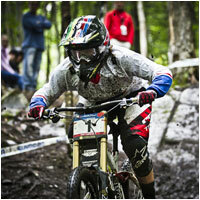 I felt good on the track, especially in the technical wood sections as these were not altered too much by the weather. The berm section at the top of the course was getting so rutted up it really was a battle just to keep your speed and get through the mud. Qualifying was one of the hardest races I could remember as the physical exertion just to keep moving in the mud in places was huge. I made a few big mistakes and had some really sketchy moments but managed to stay on and ended up winning qualifying by a big margin. I guess everyone else had also had some issues on the way down the hill ! The weather was slowly getting better and the track did slowly dry up, but there were still some really boggy sections were the water was just seeping out of the ground. I knew that I would have to find some extra speed as the conditions changed. I walked the track after qualifying with my team mates and we definitely found some good lines and had chance to really learn the track in a bit more detail. Race day came and the track was really drying out. I was last off but felt confident that I could find some more time if I rode like I had been in practice. I had a good top section and really managed to relax and ride smooth. After the first split I made a mistake in the one wooded section which then made me lose concentration and start thinking too much. I started to stiffen up and worry about crashing and felt myself making mistakes and losing time at the bottom of the track. Another mistake as I entered the final section and I thought I had not done enough, but fortunately my top section was good enough to allow me to have lost a bit of time at the bottom and still take the win by 1.8secs. 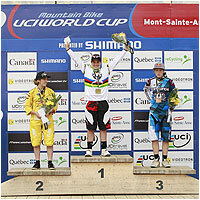 It was my 15th World Cup win, another historic moment in my career at Mont Ste Anne. It really has become an important venue in my career as it was also the venue of my first ever world cup race, back in 1997 ! Another win in the world cup series gave me some more valuable points and continued a great season so far. Next stop after some well earned Go kart action with the team was the next round in Windham, NY.